Well, it looks like I’ve made it through an entire month of this yearlong journey. I think what surprises me the most isn’t the fact that I’ve managed to find some little act to focus upon each day, or even the fact that I’ve managed to blog daily on this process–what is most amazing is that a month has gone by! It seems like I’ve just gotten started on this process, and here we are, slipping into February. So for today, I thought it would be fitting to take some time to reread and review everything I have written so far, and all the daily experiments I have taken on. I’m not going to try to draw any conclusions on where I’ve come from or where I’m going–I’m saving that bit of self-reflection for tomorrow–for today, I simply want to retrace the 31-day path that has led me from (re)reading Thoreau to this current day’s review. It took me about an hour–a little more, I suppose. I sat upstairs, door closed, in my bedroom. It was a challenge to read these reflections and not give into that writer’s impulse to edit or amend (OK, I admit it: I did fix a couple of errors I overlooked the first time around). What I wanted to try to catch a glimpse of, in reviewing all of these entries, was not just each individual, daily challenge, but the flow of one day into the next, and the impact of one attempt at simple living on the days that followed. So a short post for today as I sit with these thoughts. More reflection tomorrow…. 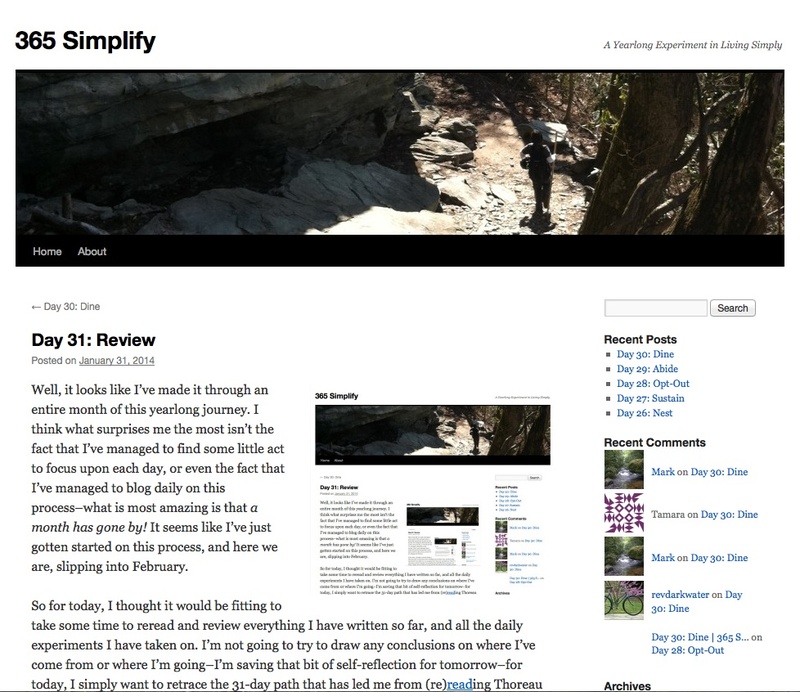 This entry was posted in Uncategorized and tagged blogging, discipline, practice, simplicity. Bookmark the permalink.